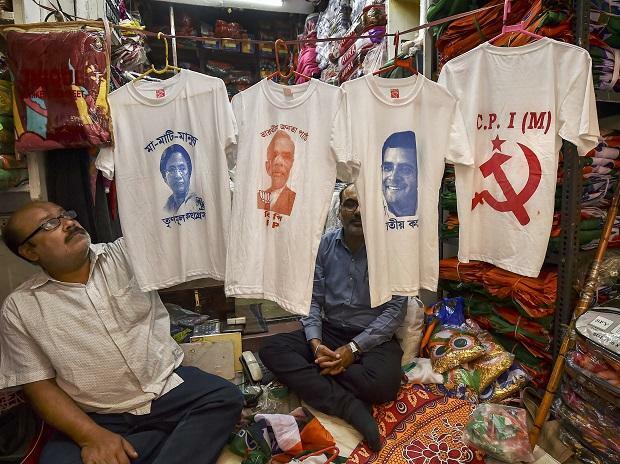 The government's push for cashless transactions has apparently not made much impact on the trade of election campaign merchandise in Bengal, as currency notes remain the preferred payment mode for poll favourites, such as party flags and t-shirts. Sale of campaign materials have picked up pace in the last one week, as the seven-phase Lok Sabha elections in the state kicks off from April 11, traders said. The response was similar from other traders in the market, who pointed out that buyers were not transacting through digital wallets and other online payment modes, as availability of cash has eased post demonetisation. "For us, the mode of transaction remains cash, as it was in 2014. Cash is most convenient and helps buyers evade Election Commission's expenditure restrictions," another shopkeeper said. Flags are a highly sought after merchandise among other poll materials like umbrella, caps, badges, paper sun-guards and scarfs.